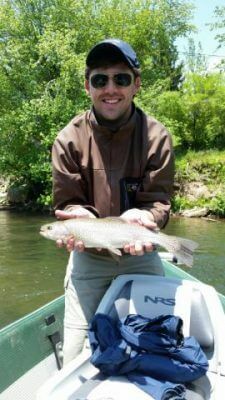 Epic trout fishing in May on Tuckasegee River Delayed Harvest over the past few weeks! This has been one of the best months in years for really great activity on the local streams. What is awesome about this time of year is you can tailor exactly what methods you desire to implement on the stream because they all work! For some folks, they want a leisurely guided float trip and catch many trout like the Birmingham, Al crew over the weekend. For me, it helps to keep it interesting with focusing on various techniques throughout the spring. Fun days for meeting those various needs such as wet fly tactics, euro-nymphing, old-school tight line nymphing, dry fly tactics, and various streamer tactics! All of these tactics have been superb over the past few weeks for the delayed harvest section of the Tuckasegee River in Bryson City and Webster, NC the past month. Springtime is among the best seasons float fishing for trout. Bryson City has the Tuckasegee River Delayed Harvest right through town! The numbers of trout caught and released were among the best of the year! The amount of insect activity and the sheer density of trout per mile of river equal EPIC. The evenings have been incredible with Light Cahills hatching where the Tuckasegee empties into Fontana Lake. This is usually “guide time” with the drift boats out in full force right below Bryson City. The hatches pour off well into the night after guide trips are over for the day. Overcast skies have kept the trout active here the past few weeks! Fish tend to move up in the water column when this occurs and makes folks wishes come true for trout fishing with wets and dry flies! The visual takes near the surface are one of the best moments in the stream for folks to witness! Pictured below is Paul Gallagher from Washington, DC whose wishes were to really focus in on some dry fly techniques. Really have enjoyed the few days of the guided wade trip discussing dry fly tips with Paul! Mother nature truly cooperated with the great overcast weather for the entire week. He will journey into the Great Smoky Mountains National Park for a trout fishing, backpacking, and camping trip. Paul could not have timed the trip any better!